Restored and rededicated in 2016, St. Andrew's Chapel is the heart of the SAS campus. Whether we are gathering there for our weekly Eucharist, all-school meetings, Sunday evening Compline, a post-victory ringing of the bells or if we are returning as alumni for marriages, baptisms, and memorial services, the Chapel is our touchstone to all that is sacred at SAS. 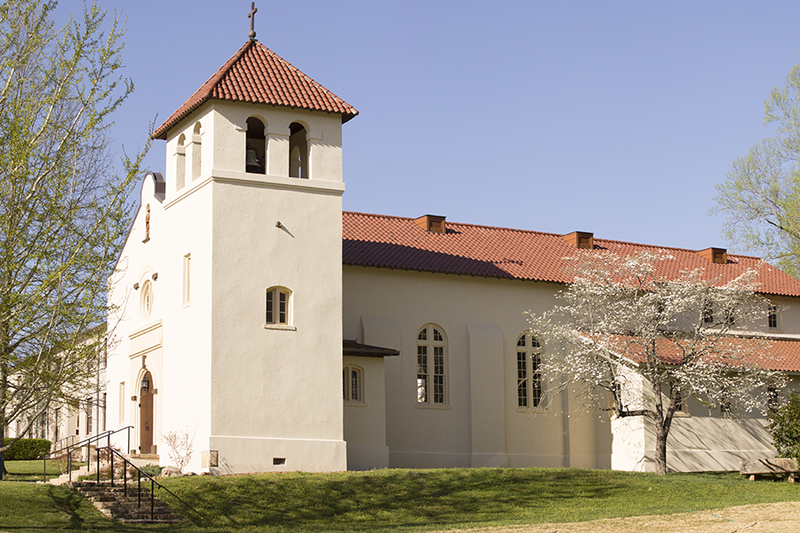 Over 100 years old, the Chapel is the oldest building on our campus. The first mass was sung in the almost competed St. Andrew’s Chapel on February 22, 1914. The building was consecrated on May 15, 1914. The Chapel architecture reflects the theology of St. Andrew’s-Sewanee School. Its beauty represents an elegant humility. Much of its iconography is donated, a reminder of the many hearts and hands that have supported the school over the years. During World War I, the Episcopal women of Morristown, New Jersey collected money to send chocolates to American soldiers. At the end of the war, they decided to allocate the balance of their funds to another worthy cause. Through one of their parishioners, they learned of St. Andrew’s, a mission school that lacked the funds to equip the bell tower of their recently completed chapel. The women sent the money for three bells as an Armistice Thanksgiving and asked that the bells be dedicated to the archangels Uriel, Raphael, and Michael. In return, the school agreed to ring the bells for 11 minutes on the eleventh day of the eleventh month at 11:11 a.m. every year in memory of those who died in World War I and as a prayer for peace. Each year, students, faculty, staff, and community members ring the bells on this day of celebration. Over the years many of the school’s German and Japanese exchange students have been among the ringers, a sign of the healing power of grace and time.